If you’ve ever spent a night tossing and turning, you know you’ll feel groggy and tired the next day. If this happens night after night, it becomes a real problem. About one out of every five people suffer from sleep deprivation and over time become out of sync with their body’s natural clock. It is estimated that there are over 80 million insomniacs around the globe. The Dutch startup Somnox want’s to help you get a good night’s rest with the world’s first sleep robot. Made of comfortable and washable fabric, it is designed to improve your sleep by helping you regulate your breathing and providing soothing “pillow talk”. The 12 strong outfit has made it their mission to “help 100,000 people achieve a good night’s rest by 2025”. The main novelty for such a device is that it simulates human breathing. 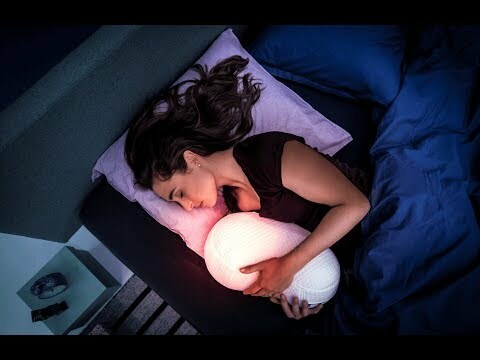 The idea is that by hugging the peanut shaped robot pillow, users will feel the rising and falling sensations which will in turn prompt them to adjust their breathing rhythms to that of the robot. It is a well researched fact that slow breathing can help naturally reduce stress and increase relaxation. In early product testing, Somnox found that their device was particularly effective when it came to helping people who have a trouble falling asleep as a result of stress or anxiety. To further soothe the body and mind, the device emits audio. This could be anything from the sounds of heartbeats to guided meditation, or even lullabies! Personal preferences can be set in the accompanying iPhone and Android smartphone app. Although a bit pricey, the gadget is doing well on Kickstarter. With 10 days to go and delivery expected in the summer, it is comfortably above its €100,000 goal. The package includes the Somnox sleep robot, a washable sleeve and the accompanying smartphone app.